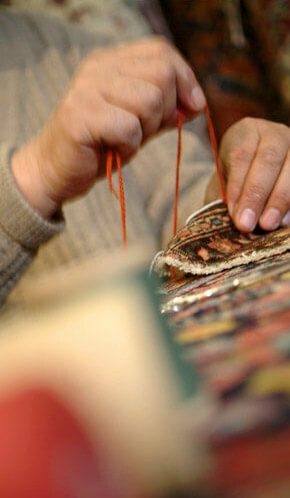 PTK Oriental Rug Center specializes in all kinds of repairs for all carpets. Stop in one of our three store locations in Millburn, NJ, Bryn Mawr and New Hope, PA.
On site experts specializing in conditioning of antiques to the best original condition. Reweaving tears and holes from animal or traffic damage. Dye touch ups applied with special ink. Cleaning all types of rugs specializing in Old and Antique Rugs which require special attention.